WASHINGTON — New parking signs have popped up that are both confusing and incorrect near the recently-opened Giant on Wisconsin Avenue in Northwest D.C.
People who live and work in the surrounding McLean Gardens neighborhood find the signs very confusing. Let’s break down the signs and what went wrong. The red “No Parking” signs should have arrows pointing toward the areas where parking is illegal, such as in front of a garage entrance and within 25 feet of a stop sign or intersection. The green, two-hour parking signs list the wrong times. 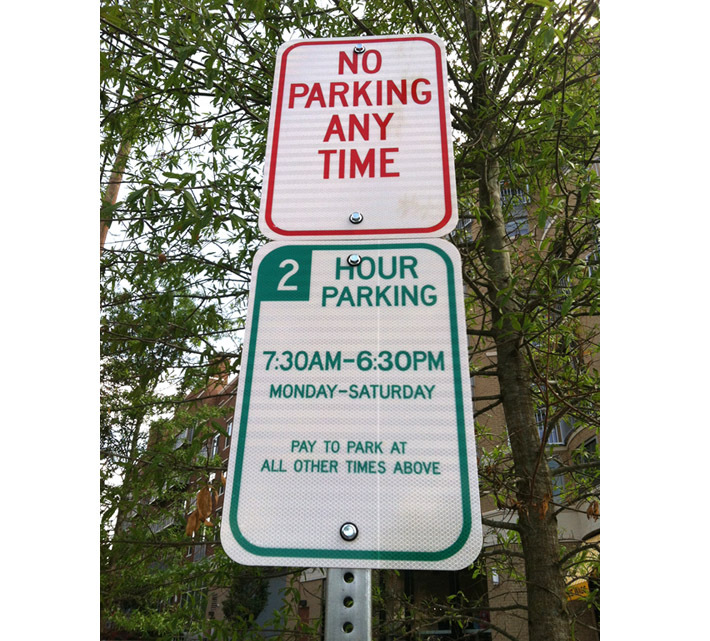 Two of the two-hour parking signs correctly list the two-hour parking hours as between 7 a.m. and 6:30 p.m. However, others incorrectly list the hours as between 7:30 a.m. and 6:30 p.m.
Also, the signs with the correct times omit the word “other” on the bottom to avoid confusion. The word “other” on the incorrect sign is misleading. Parkers have to pay to use those spots during the day. D.C. Department of Transportation Director Leif Dormsjo reviewed the signs last week and agreed with WTOP Ticketbuster that they were both confusing and incorrect. “It was installed by a contractor. It’s not a standard sign and we will address the problem,” wrote Dormsjo in an email to WTOP. He reviewed the signs with DDOT staff earlier this week to discuss how and when to fix the error.